A study recently published in JAMA (the peer-reviewed medical Journal of the American Medical Association), Association of Frequency of Organic Food Consumption With Cancer Risk (10/22/18), suggests that a higher frequency of organic food consumption was associated with a reduced risk of cancer. Although organic foods are less likely to contain pesticide residues than conventional foods, few studies have examined the association of organic food consumption with cancer risk. Past epidemiological studies have found a higher incidence of some lymphomas among farmers and farm workers who are exposed to certain pesticides through their work. But sadly, once trusted epidemiology studies are scorned by the current E.P.A., now backed and influenced by agrochemical companies, as reported by Danny Hakim and Eric Lipton in Once-Trusted Studies Are Scorned by Trump’s E.P.A. (NY Times, 8/26/18). Julia Baudry, a researcher with the French National Institute of Health and Medical Research (at its Center of Research in Epidemiology and Statistics Sorbonne Paris Cité), the lead author of this large study of 70,000 adults, in a news article by Roni Caryn Rabin in the New York Times, Eyeing Organic Food as Cancer Foe (10/30/18), noted that We did expect to find a reduction, but the extent of the reduction is quite important. Researcher Baudry carefully added that although the study does not prove an organic diet causes a reduction in cancers, it strongly suggests that an organic-based diet could contribute to reducing cancer risk. Nearly 70,000 participants in the study reported their consumption frequency of labeled organic foods ((i) never, (ii) occasionally, or (iii) most of the time). An organic food score was then computed (range, 0-32 points). Of the 68,946 participants, 78% were female and the mean age at the baseline was 44.2 years. At two follow-up dates, May 10, 2009 and November 30, 2016, 1340 first incident cancer cases were identified: the most prevalent being 459 breast cancers, 180 prostate cancers, 135 skin cancers, 99 colorectal cancers, 47 non-Hodgkin lymphomas, and 15 other lymphomas. The study found that high organic food scores were inversely associated with the overall risk of cancer. We previously reported on a study by the International Agency for Research on Cancer, an arm of the World Health Organization, that placed glyphosate (the active ingredient in Monsanto’s Roundup) in the second highest category for cancer risk of probable carcinogen. Monsanto’s Roundup is the most widely used weed killer in America, with the vast majority of soybeans, corn, and cotton grown from Monsanto’s Roundup Ready GMO (genetically modified organism) seeds. 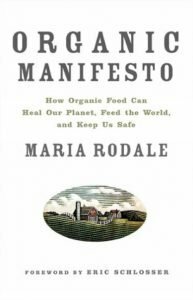 Maria Rodale’s succinctly emphasizes in her must-read Organic Manifesto (Rodale, Inc. [distributed to the trade by Macmillan], New York, New York, 2010) that glyphosphate gets inside plants we eat and can’t wash off. The Organic Consumers Association (OCA) recently noted that there are about 8,700 lawsuits pending against Monsanto, by people who allege that exposure to Roundup weedkiller is responsible for their cancer. And OCA emphasizes that most of the people behind these lawsuits have stories similar to the one told by Dewayne Johnson, during his landmark jury trial which resulted in a unanimous decision against Monsanto.